Lodge Cottrell is a well-established supplier of Air Pollution Control and Material Handling systems. Founded in May 1913 by Professor Sir Oliver Lodge FRS our core business remains assisting industrial facilities to meet the standards required for their flue gas emissions – which we achieve by the utilisation of our in-house technologies that have been developed over the decades for thousands of applications across the world. Currently Lodge Cottrell mainly serves customers throughout Europe, Turkey, Russia and CIS, the Middle East and Africa. Other projects are managed in different parts of the world dependent upon the customer’s wishes. 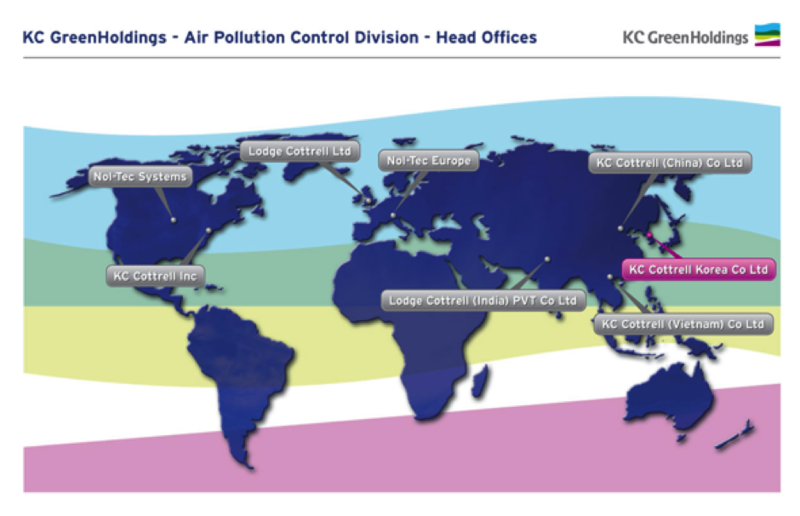 With Nol-Tec Inc managing projects throughout the Americas and KC Cottrell exploiting their expertise in the Far East and India – any customer anywhere in the world can be satisfied for their air pollution control requirements by a KC GreenHoldings business. Since 2005 Lodge Cottrell has been solely owned by KC GreenHoldings which is based in Seoul and listed on the Korea Stock Exchange. KC GreenHoldings develops innovative technologies for protecting the environment. Currently, it comprises of over 35 separate businesses, including Lodge Cottrell, each of which is involved in providing much-needed ‘green’ services – from waste management, renewable energy and air pollution control, and has a turnover of around $700m/a.